Melton RFC gave a good account of themselves in defeat to the runaway league leaders who are sweeping aside all before them this season. There were some enforced changes to injury in the backs for the trip to Warwickshire with Harvey Green slotting in at full-back, and James Woolley and Harry Wood on the wings. The opening exchanges were ferocious with commitment from both sides. Newbold threw everything into attack with some well-drilled moves from forwards and backs, but Melton launched a series of attacks from a lineout near the hosts’ line. Melton used the scrum well to apply pressure and came close in a tense spell, but Newbold defended well. 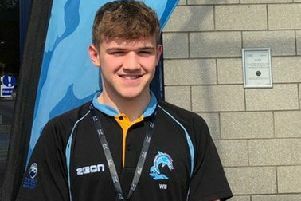 The scrum collapsed once too often for the referee’s liking as Kieran Stone gave his opposite number a torrid time, and the Newbold prop was yellow-carded. A pushover try looked on the cards, but just as the Melton eight got a concerted shove on, the ball squirted out and Newbold hacked clear. Scrambling back in defence Melton were caught offside and fell behind to a penalty. Lee Miller was then sin-binned and Newbold used the lineout penalty to drive over for a converted try. Stung into action, Melton threw everything at the home side, but several phases of attack failed to breach a well-organised defence. A back-handed flip out of a tackle was then intercepted and the winger sped away to score. The conversion opened up a 17-0 lead: a poor reflection of the visitors’ efforts. Straight from the re-start Melton finally got on the scoreboard through Matt Cox’s sweet penalty strike. Another Cox penalty followed after an illegal shoulder charge which should have settled the visitors who were playing well, but an unsubtle offside handed Newbold an easy three points. Melton pressed, but in their haste a wayward pass handed over possession and excellent support play gave Newbold another converted try and a 27-6 half-time lead. Dan Wakefield, the target of robust off-the-ball activity, was forced off at half-time, so James Newman bolstered the second row. Melton had the worst possible start when Cox’s poor clearance fell straight to the speedy winger who linked well with his full-back to score a soft try under the posts. The conversion was added. Frustration crept into Melton’s game, foolishly conceding a penalty for back chat and the Newbold lead reached a comfortable 37-6. Remarkably this spurred Melton into life. Chris Rose came on at scrum-half and got the back line moving with some probing runs and well-timed passes. The forwards raised their game and from a lineout, a well-organised rolling maul drove Newbold back and James Newman dotted down. Almost immediately from the restart Leon Gormley won another turnover ball at the breakdown, Rose spun the ball out, and Gareth Collins and Carl Prior linked well to release Wood down the line. The covering defence looked to have snuffed out the chance, but Wood’s clever chip was superbly read by Green who gathered the tricky bounce brilliantly and dived over for an excellent try. Melton had their tails up and tested a well-drilled defence which quickly stifled the attacks despite some sterling efforts, particular from Stone who had another fine game. The frustration had switched to Newbold as a high tackle saw their flanker carded. Woolley’s stunning run from deep in his own half was held up over the line, and Stone was also frustrated when he appeared to have scored from a drive in a tight call. Melton were finally rewarded when a series of attacking scrums led to a penalty try and Cox added the conversion. A testing time against deserved winners, but the scoreline could have been much closer had Melton played with more composure at key moments. Melton: W. Brookes, M. Badham (c), K. Stone, S. Badham, D. Wakefield, L. Gormley, K. Bugby, L. Miller, D. Lennox, M. Cox, C. Prior, G. Collins, J. Woolley, H. Wood, H. Green, C. Rose, J. Newman, D. Osborne.